Sakis Gouzonis, a multi-award-winning composer, released his 10th electronic music album on April 17. Titled Amazing Space, the composer’s new album consists of ten instrumental electronic music tracks inspired by space exploration and the technological breakthroughs that were being made during the time in which he was recording this album. Comprised of complex rhythmic patterns, beautiful melodies, monumental instrumentation and organic textures of electronic soundscapes, “Amazing Space” evokes strong emotions, sending its listeners on a 10-track journey through time and space. Sakis Gouzonis, who was born in Thessaloniki, Greece, is a prolific music composer and orchestrator. 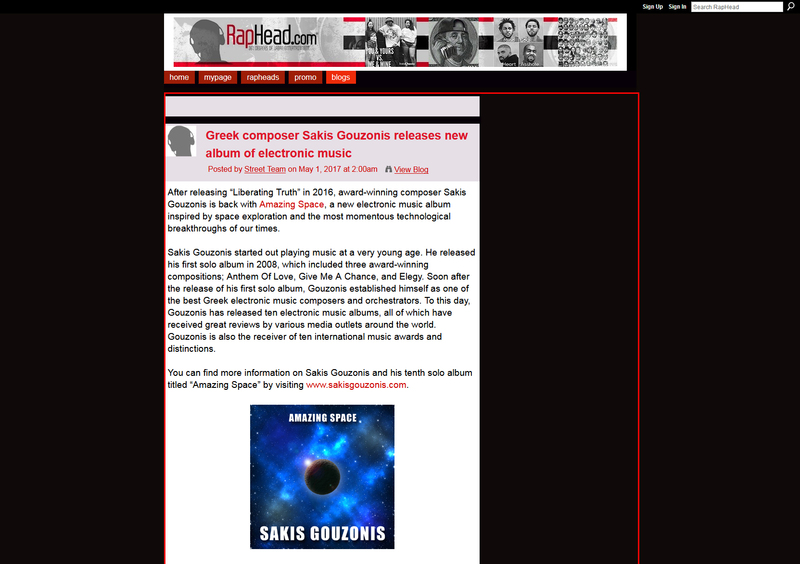 Up to now, Sakis has released 10 instrumental electronic music albums, has won a total of 10 international music awards and distinctions, and has gained more than 740,000 fans and friends in 220 countries and territories. His new album, “Amazing Space,” is now available at https://www.sakisgouzonis.com. After releasing “Liberating Truth” in 2016, award-winning composer Sakis Gouzonis is back with Amazing Space, a new electronic music album inspired by space exploration and the most momentous technological breakthroughs of our times. Sakis Gouzonis started out playing music at a very young age. He released his first solo album in 2008, which included three award-winning compositions; Anthem Of Love, Give Me A Chance, and Elegy. Soon after the release of his first solo album, Gouzonis established himself as one of the best Greek electronic music composers and orchestrators. To this day, Gouzonis has released ten electronic music albums, all of which have received great reviews by various media outlets around the world. Gouzonis is also the receiver of ten international music awards and distinctions. 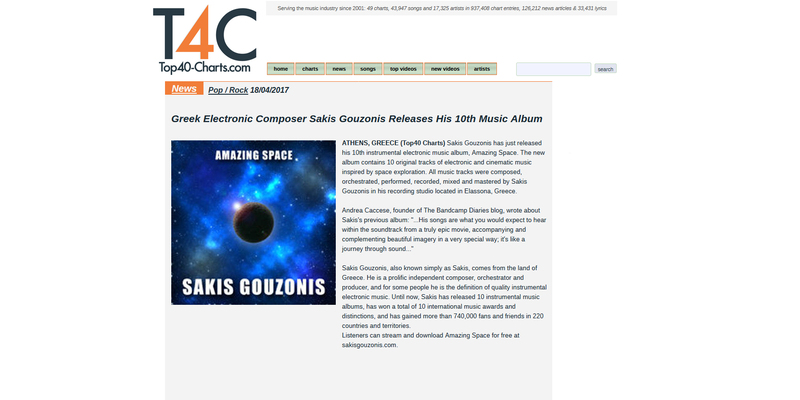 You can find more information on Sakis Gouzonis and his tenth solo album titled “Amazing Space” by visiting www.sakisgouzonis.com. Sakis Gouzonis has just released his 10th instrumental electronic music album, Amazing Space. The new album contains 10 original tracks of electronic and cinematic music inspired by space exploration. All music tracks were composed, orchestrated, performed, recorded, mixed and mastered by Sakis Gouzonis in his recording studio located in Elassona, Greece. 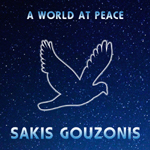 Sakis Gouzonis, also known simply as Sakis, comes from the land of Greece. He is a prolific independent composer, orchestrator and producer, and for some people he is the definition of quality instrumental electronic music. Until now, Sakis has released 10 instrumental music albums, has won a total of 10 international music awards and distinctions, and has gained more than 740,000 fans and friends in 220 countries and territories. 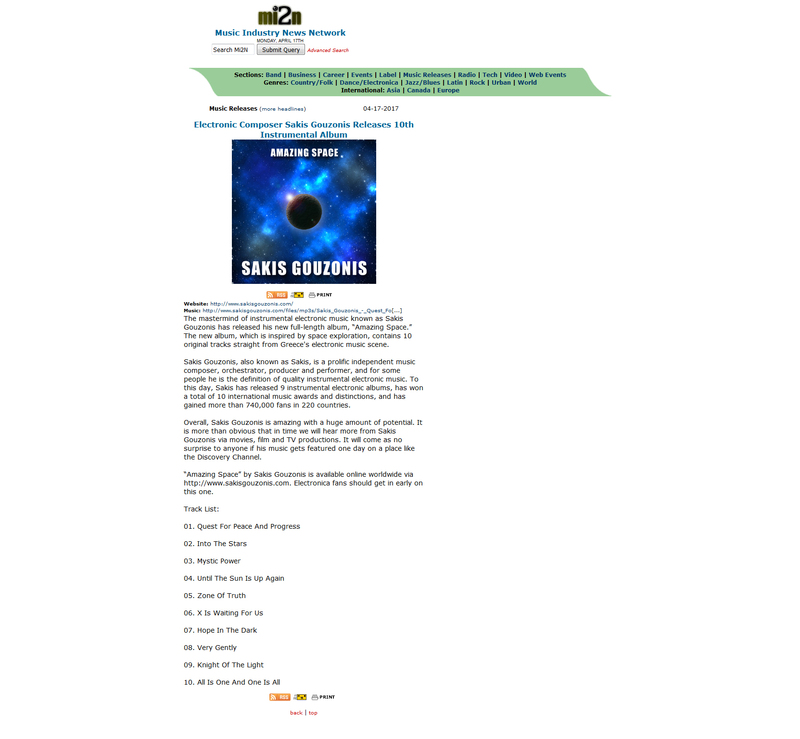 Listeners can stream and download Amazing Space for free at sakisgouzonis.com. 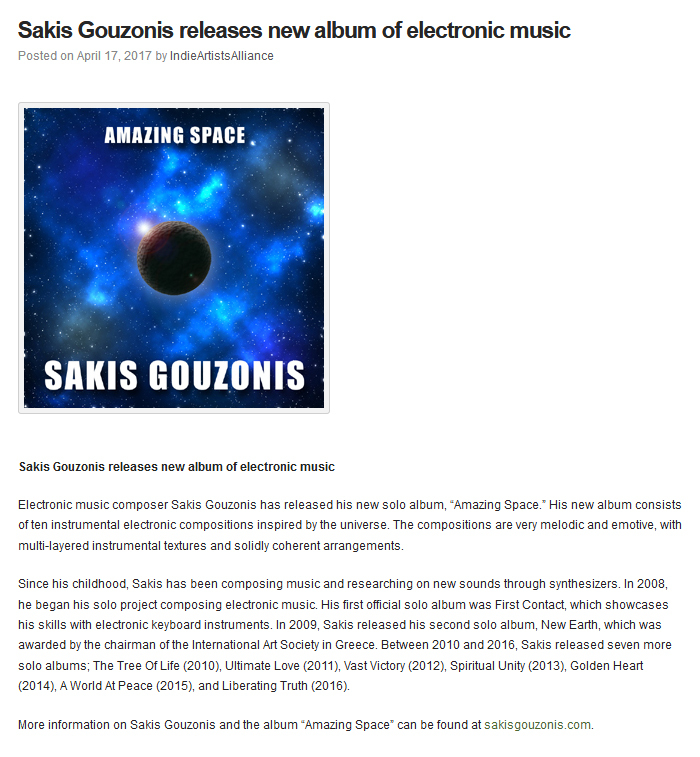 Electronic music composer Sakis Gouzonis has released his new solo album, “Amazing Space.” His new album consists of ten instrumental electronic compositions inspired by the universe. The compositions are very melodic and emotive, with multi-layered instrumental textures and solidly coherent arrangements. Since his childhood, Sakis has been composing music and researching on new sounds through synthesizers. In 2008, he began his solo project composing electronic music. His first official solo album was First Contact, which showcases his skills with electronic keyboard instruments. In 2009, Sakis released his second solo album, New Earth, which was awarded by the chairman of the International Art Society in Greece. Between 2010 and 2016, Sakis released seven more solo albums; The Tree Of Life (2010), Ultimate Love (2011), Vast Victory (2012), Spiritual Unity (2013), Golden Heart (2014), A World At Peace (2015), and Liberating Truth (2016). 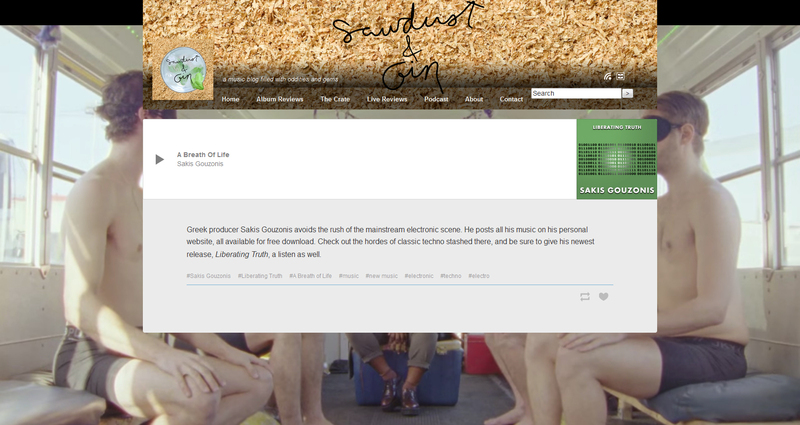 More information on Sakis Gouzonis and the album “Amazing Space” can be found at sakisgouzonis.com. 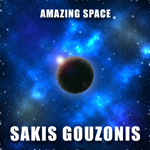 Sakis Gouzonis has released his brand new album, Amazing Space , via his official website. Amazing Space, which is inspired by space exploration and development, consists of 10 instrumental electronic music tracks. Hailed by Blazing Minds as an “excellent producer and songwriter,” Sakis Gouzonis is a Greek composer and keyboardist based in Elassona whose works straddle the line between classical and electronic with a haunting sound. His critically acclaimed debut full album First Contact was released in 2008. Since then, Gouzonis has released eight more full albums; New Earth (2009), The Tree Of Life (2010), Ultimate Love (2011), Vast Victory (2012), Spiritual Unity (2013), Golden Heart (2014), A World At Peace (2015), and Liberating Truth (2016). Gouzonis’ tenth instrumental electronic album, Amazing Space, is now available on his official website, https://www.sakisgouzonis.com. The mastermind of instrumental electronic music known as Sakis Gouzonis has released his new full-length album, “Amazing Space.” The new album, which is inspired by space exploration, contains 10 original tracks straight from Greece’s electronic music scene. Sakis Gouzonis, also known as Sakis, is a prolific independent music composer, orchestrator, producer and performer, and for some people he is the definition of quality instrumental electronic music. To this day, Sakis has released 10 instrumental electronic albums, has won a total of 10 international music awards and distinctions, and has gained more than 740,000 fans in 220 countries. Overall, Sakis Gouzonis is amazing with a huge amount of potential. It is more than obvious that in time we will hear more from Sakis Gouzonis via movies, film and TV productions. It will come as no surprise to anyone if his music gets featured one day on a place like the Discovery Channel. “Amazing Space” by Sakis Gouzonis is available online worldwide via https://www.sakisgouzonis.com. Electronica fans should get in early on this one. Greek producer Sakis Gouzonis avoids the rush of the mainstream electronic scene. He posts all his music on his personal website, all available for free download. Check out the hordes of classic techno stashed there, and be sure to give his newest release, Liberating Truth, a listen as well. Sakis has announced that he is releasing a new instrumental album in April 2017. Soon after the release of his debut album, First Contact, Sakis established himself as one of the best Greek electronic music composers and orchestrators, astonishing critics and audience alike with the beauty, depth, and maturity of his music. Since then, Sakis has released eight more albums; New Earth (2009), The Tree Of Life (2010), Ultimate Love (2011), Vast Victory (2012), Spiritual Unity (2013), Golden Heart (2014), A World At Peace (2015), and Liberating Truth (2016). 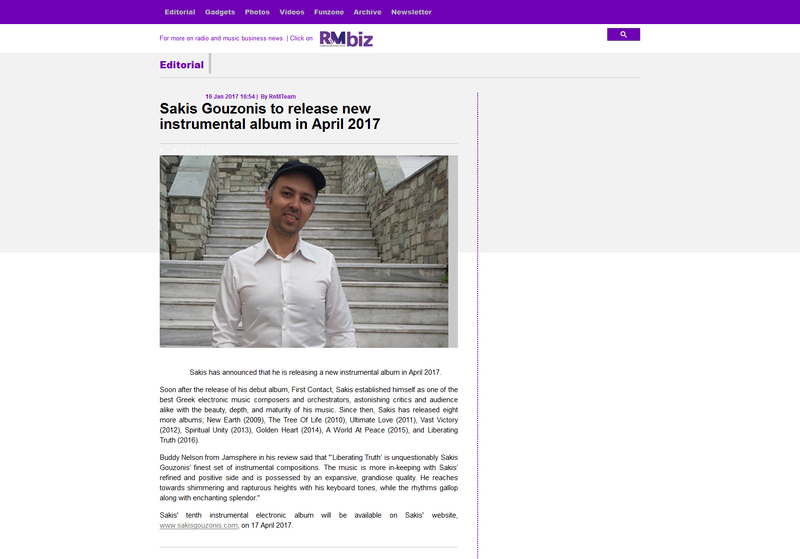 Sakis’ tenth instrumental electronic album will be available on Sakis’ website, www.sakisgouzonis.com, on 17 April 2017. Sakis Gouzonis has announced that he is releasing a new instrumental album in April 2017. Soon after the release of his debut album, First Contact, Sakis established himself as one of the best Greek electronic music composers and orchestrators, astonishing critics and audience alike with the beauty, depth and maturity of his music. Since then, Sakis has released eight more albums; New Earth (2009), The Tree Of Life (2010), Ultimate Love (2011), Vast Victory (2012), Spiritual Unity (2013), Golden Heart (2014), A World At Peace (2015), and Liberating Truth (2016). 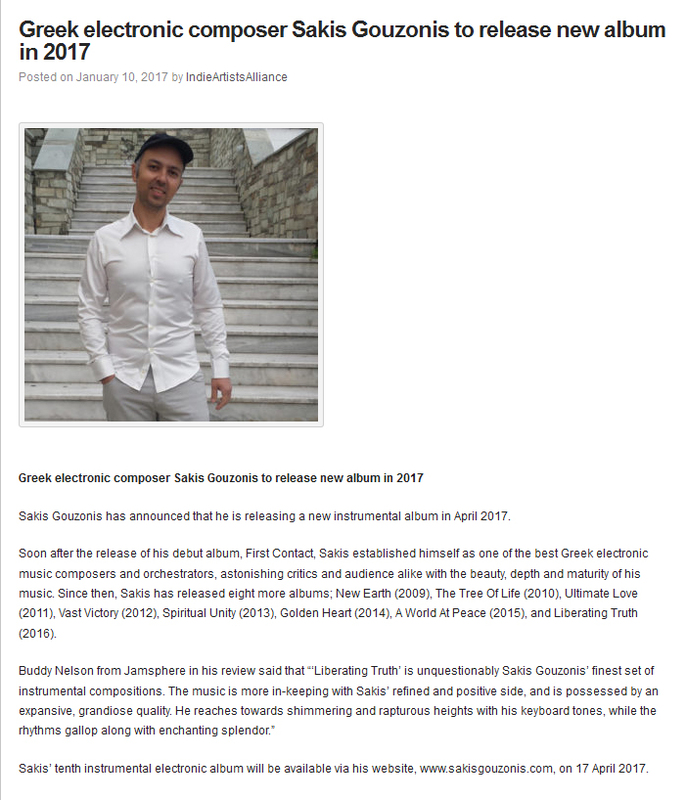 Sakis’ tenth instrumental electronic album will be available via his website, www.sakisgouzonis.com, on 17 April 2017. Sakis is one of the world’s most prolific composers today. In 2008, Sakis released his first instrumental electronic album, First Contact, which included three award-winning music compositions, Anthem Of Love, Give Me A Chance, and Elegy. In 2009, Sakis released his award-winning second instrumental electronic album, New Earth, which included two award-winning music compositions, Elohim, and Eternal Peace. In 2010, Sakis released his third instrumental electronic album, The Tree Of Life, which included the award-winning music composition Seed Of Hope. 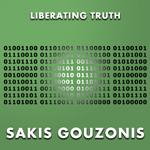 From 2011 to 2016, Sakis Gouzonis released six more instrumental electronic albums; Ultimate Love (2011), Vast Victory (2012), Spiritual Unity (2013), Golden Heart (2014), A World At Peace (2015), and Liberating Truth (2016). The new instrumental electronic album will be released via Sakis’ website on 17 April 2017.